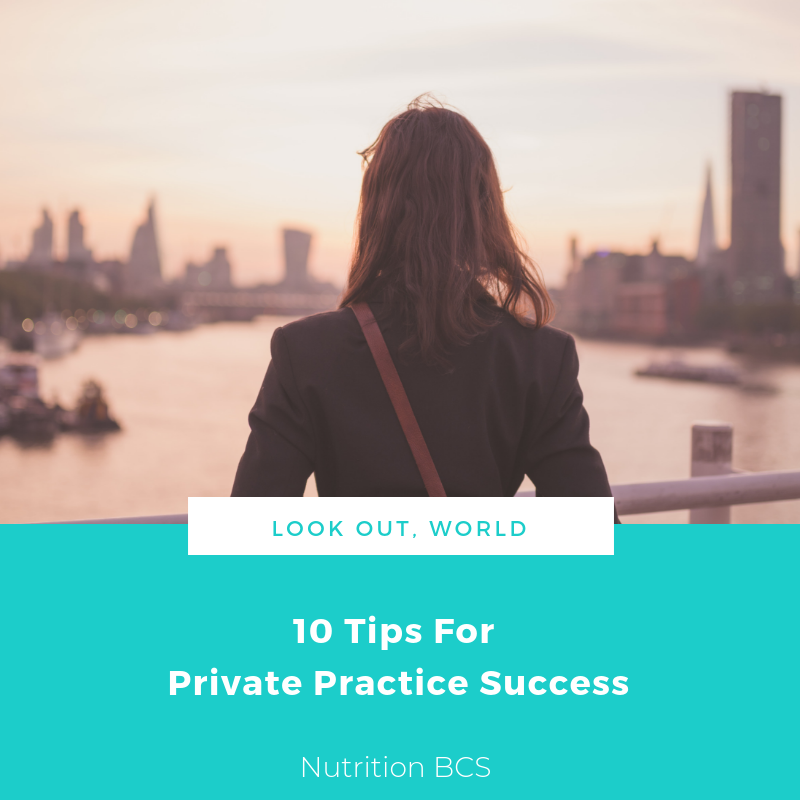 Enjoy these 10 tips to achieve private practice success. We recently shared tips on the Nutrition BCS blog for increasing your client volume, such as giving nutrition presentations, online marketing and networking. 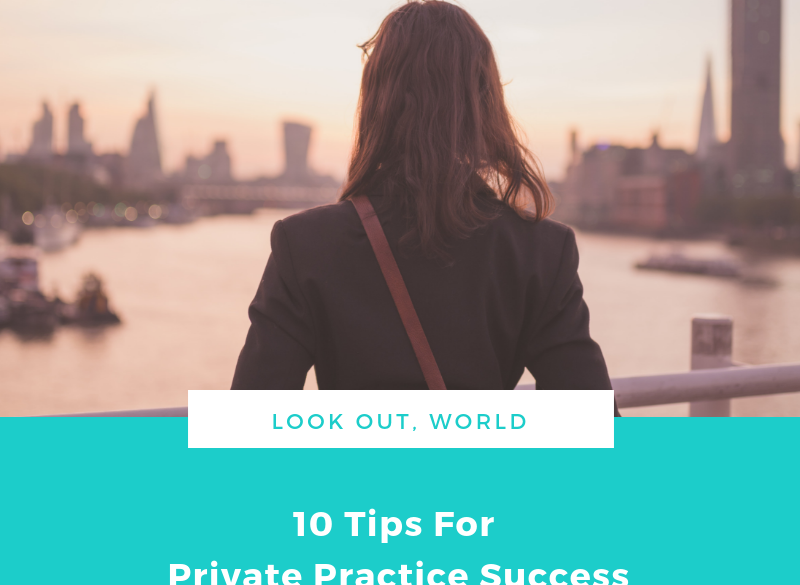 Today, we’re providing ten simple but perhaps lesser-known tips for improving the efficiency of your private practice – think of these as our ten top tips for private practice success! They fall into a variety of buckets, such as marketing, banking, design and more. Let’s jump in! 1. Set up a Business Banking Account: If you haven’t already done so, make sure that income that you are making from your private practice counseling sessions (or nutrition business) is deposited into a separate business checking or savings account, rather than a personal one. Your accountant will thank you, and so will the IRS. You’ll want to keep these separate from personal accounts for tax purposes. 2. Email Marketing: Be sure that you’re collecting contact information from those who visit your website; invite visitors to sign up for your email updates. Then, use a vehicle such as MailChimp to reach out to those via e-blasts who are interested in your services and products on a regular basis. 3. Join the Nutrition Entrepreneurs Dietetic Practice Group: I can’t say enough positive things about Nutrition Entrepreneurs; join 4,000+ like-minded dietitian entrepreneurs for networking, webinars, educational opportunities, local “mini-meetings” in your area and more. 4. Hire a Business Coach: Here at Nutrition BCS, we believe you can never have too much support. There’s no such thing! Reach out to me to learn how I can help you figure out your next business step, how to push past a challenge you are experiencing, how to get more organized, how to market your services and more. The world needs your nutrition expertise; it’s time to take that next step! 5. Use a Cloud-Based Electronic Health Record System: If you’re not already using an electronic health record (EHR) system in place of paper charting, it’s time to upgrade! There are numerous charting options out there, such as Kalix (use code NBCS20Kalix for 20% off a one-year subscription), that will allow you to be more efficient and organized when it comes to collecting and tracking patient information, history and progress. 6. Set Up a Business Email Account: Gmail and Hotmail accounts are sufficient for personal use, but not necessarily so for business use. There are potential HIPAA violations for sure! You would need to use encryption in order to secure emails from these accounts. Take advantage of the opportunity to brand your business and use secure accounts by setting up a business email using either G Suite or Office365. 7. Beautify Your Marketing Materials: It’s easier than ever to design your own social media posts, postcards, business cards and more, using resources such as Canva. There’s no need to hire a graphic designer! Pull free stock images for use from sites such as Pixabay, Pexels and Unsplash. 8. Source Business and Private Practice Templates: Why recreate the wheel when you need forms, handouts or templates – it’s quite likely that another RDN has already created these materials for use. Take a look at the forms offered by Nutrition BCS, such as the New Patient Information Sheet, Consent Form and Financial Agreement. Peruse the hundreds of templates and educational offerings created by RDNs for RDNs on the RD2RD.com digital marketplace as well. 9. Form a Mastermind Group: Many RDNs will say that creating a small mastermind group of like-minded dietitians has helped them shape or grow their business. Network with others via various closed RDN-only Facebook groups such as Dietitians in Private Practice to find your tribe. 10. Join Networking Groups in Your Area: In addition to connecting with others in the profession, be sure to network with others outside of our field. You will glean insights from others’ learnings and experiences. Try attending various women’s business groups, your local chamber of commerce meeting, meetings held at a co-working space and more. Try Meetup.com for ideas as well – you never know, your next great business idea might come on a bike ride with 20 others this coming weekend! Looking to learn how to start your private practice, grow your business, or go from a solo-RDN practice to a group practice, give us a shout!